What Is a Substitute for Lecithin? Lecithin is a food additive that acts as an emulsifier and maintains food moisture. An emulsifier acts to keep ingredients together that would separate if left alone, such as oil and water. While previously made from egg yolk, lecithin is now usually made from soybeans. You can buy lecithin as a powder, a liquid or moist granules. Food manufacturers add lecithin to foods such as chocolate, margarine, peanut butter and powdered baked-good mixes. Instead of using lecithin additives in a recipe, you can add eggs, which contain natural lecithin in the yolks. Lecithin was discovered in egg yolks in 1846. Although soybean lecithin has generally replaced egg lecithin, eggs are still used for their emulsifying properties in products such as ice cream and mayonnaise. Monoglycerides and diglycerides are types of emulsifier often used in commercial food production. 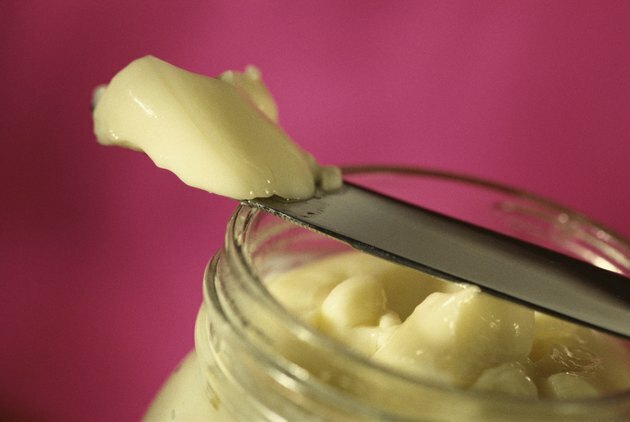 These emulsifiers, manmade from fat and glycerine, are often used in products such as shortening, margarine, caramel, peanut butter and icing. Some oils are used as emulsifiers. Brominated vegetable oil is added to certain types of sodas. The Center for Science in the Public Interest notes that caution should be taken with brominated vegetable oil; it leaves traces in body fat, although it is not known yet if this is a risk. Diacylglycerol is another type of oil used as an emulsifier. Coconut, palm, palm kernel and vegetable oils are sometimes made into monoglycerides and diglycerides. Some sugars are used as emulsifiers and to provide sweetness to a recipe. Oligofructose is one type, made from sucrose, that is added to cookies, granola bars and frozen desserts. Other sugars, such as honey and sugar esters, can also act as emulsifiers. What Is Sucrose Acetate Isobutyrate?